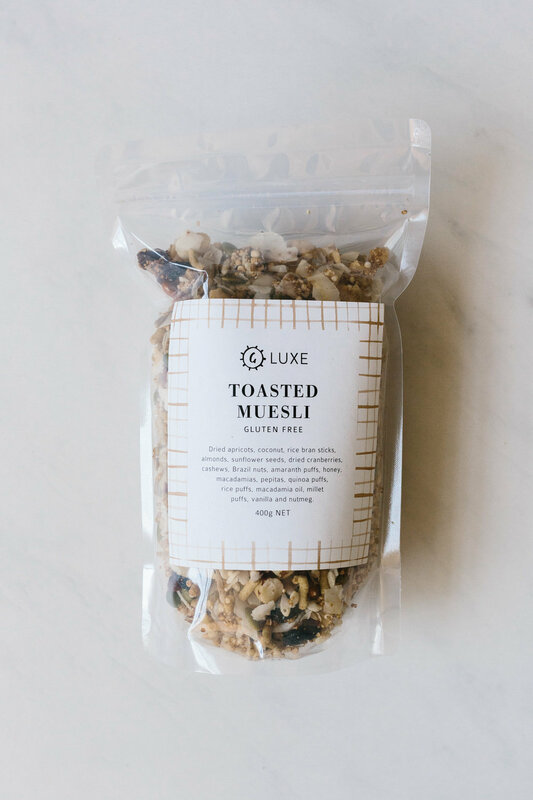 G. LUXE is an everyday luxe, healthy, wholesome, Australian made muesli and snack bar range. I love the saying 'we are what we eat' and I love it when people draw the connection between eating well and feeling well. So; I set out just over five years ago now to create a range of food (in this ever growing complicated, processed food world we live in) that was simple, whole, seriously delicious and cherry on the top good for you too. In our range, you will find three mueslis and four bars. They are all gluten and dairy free, some are Paleo, Vegan, raw and fructose free too. Made with beautiful, natural, health enhancing ingredients, I wanted to educate y'all (on a much broader scale than one client at a time) that eating healthy really is easy. It tastes great. And, it feels awesome. G. LUXE can be found (online; check out our 'Shop' on the next tab) in a number of superb cafes (mostly around Melbourne) as well as Independent supermarkets, health and whole food stores and wellness studios/gyms. Let healthy, whole foods nourish our bodies, minds, lives.